1. You need to join an organized shore excursion by any local tour company in Saint-Petersburg if you don’t want to get Russian tourist visa. (The only exception is for those who come from a country that has a visa-free agreement with Russia). Such tours are to be booked in advance. Remember, you can leave the ship only with a tour – some people think that they can book an excursion and then go out somewhere on their own after coming back to the ship. No, it will not work. More on cruise visa rules in St Petersburg here. If you want to explore the city on your own, you need to get Russian multy-entry tourist visa in advance. It’s rather expensive to get it for a couple of days only and the process is not very obvious, so in the majority of cases it makes sense to join a tour instead. You will also need a Russian visa if you are coming to St Petersburg or leaving it not onboard a cruise ship. 2. The main port of St Petersburg called Marine Facade is not in the city center. It’s not the only place where cruise ships can dock in out city, but the majority of them come to this one. ( Small luxury ships like Seabourn usually dock in other places close to the city center.) What does the location of Marine Facade mean for you? First, if your health & activity level allow that, it’s more efficient to book full-day tours rather than half-day tours as you will have more time in the city this way (driving back and forth takes time). Second, if you plan to move around on your own, you will need to take a bus and then a metro ride to get to the city center or to take a taxi. Unfortunately the taxi company that serves the port is more expensive than other taxi companies in St Petersburg. 3. 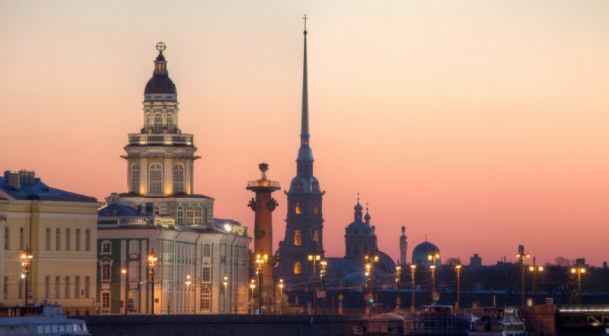 St Petersburg is a big city with more than 5 million people, so if you want to see the most of it, the sightseeing will be very active and you will have to walk a lot. As a tour guide, I have difficulties trying to explain my clients how active the tours will be as everybody has different activity level. Even if you will be moving around by car, you will still need to walk quite a lot if you want to see the Hermitage, the Catherine palace and Peterhof as you will need to walk for at least 1,5 hours in each of these places (and there are other museums as well). 5. Wear multi-layer clothes and don’t forget to pack an umbrella or a rain poncho – we can have lots of rain in St Petersburg even in summer. And do keep your valuables and passports in a very secure place – as any popular tourist destination, we have pick-pockets. No high heels, just comfortable walking shoes. It’s better not to wear anything really short if a visit to the cathedrals is included into a tour program (knee-length is fine). 6. Even if you are on a private shore excursion, don’t expect a complete flexibility. The reason for that are some rules that tour companies in St Petersburg need to deal with. When you get a tour voucher with the description of the program after booking a tour, the travel information is also provided to port authorities. That means that they know at what time more or less you should be back to the ship. In other words, you can’t add some time-consuming activity like a theater visit at the very last moment or upon arrival as your tour program will already be at the port. Besides that, the main museums like the Hermitage, the Catherine palace and the Grand palace of Peterhof schedule specific entry time to all guided visitors and tickets to these places are booked in advance. The more places to visit are included in your cruise tour in St Petersburg, the less flexible it becomes. 7. In spite of the fact that lots of places in St Petersburg accept credit cards now, it’s still recommended to have some local cash (Russian rubles) on your cruise tour. Shops, museums, public transport will not accept currency, but there are many banks and ATMs in the city where you can get rubles. Many souvenir shops accept USD or Euros, but the exchange rate is worse.